There are a number of reasons for people setting up surveillance cameras around their home or business. Sometimes, there have been prior break-ins and the home or business owner may want to catch repeat offenders in the act. Other times, there have been recent equipment upgrades that need to be kept as safe as possible. Or, you simply may want to know who has been coming and going, and when. Having the right system and cameras will make a huge difference in whether you capture the footage that you’re hoping to capture. 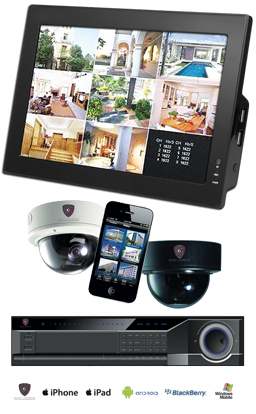 For that reason, ABC Tech Group has HD/IP camera systems that are sure to work for you. Here are several reasons that choosing to go with ABC Tech Group as opposed to trying to set it up on your own is the best option for you and your home or business. ABC Tech Group has a team of experienced professionals that can help you every step of the way, from choosing the HD/IP cameras that work best for you to setting up the system so that you can view the footage from any number of devices. No matter what major platform you are planning on using to view your surveillance footage, ABC Tech Group will allow you to see it flawlessly. They will connect you with their programs that allow you to see the surveillance footage on your Mac, PC, tablet, or smart phone, so you never have to be without access to the footage. Seamless viewing capabilities across a number of platforms means never missing a moment. There’s nothing more frustrating than having HD/IP cameras set up but not know how to use them. That’s why ABC Tech Group provides you with their program which is simple and easy to use. They have developed a universal on-screen start-up menu that is the same for all of their services. This is especially good news for those who already use ABC Tech Group for their technology solutions. One of the main goals of ABC Tech Group is to provide you and your business with quality commercial-grade equipment and tech solutions at affordable prices. In fact, you will find it hard to find another company that offers the same level of professionalism, expertise, and high-quality HD/IP cameras at the same affordable prices as ABC Tech Group. Whether you use a Mac or PC, want to view your system through a smartphone or a tablet, our systems are all designed to be viewed seamlessly across all major platforms. Furthermore because we have developed a universal on-screen set-up menu, whether you’re installing one of our fan-less DVRs one day and an IP system the next, the system menu will always be the same, making life easier for you. We have a really simple pricing philosophy; to offer you commercial grade, professional systems at affordable prices. For example take a look at our innovative plug and play IP systems. We believe you won’t find a better product in its class at a more competitive price anywhere on the market.